I received a link on Facebook the other day which had a picture of a pigeon in colorful crochet. I started to pass it on quickly by sharing it on my Wall. Instead, I decided to go further. And I’m so glad I did. 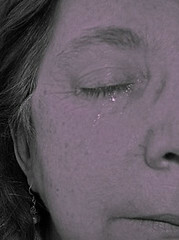 I traveled that link to other links and finally arrived at the site for the artist (Laurel Roth). “…Roth takes pigeons (hand carved mannequins), sets them on stands, and crochets yarn coats for them to look totally and wholly fancy in. Everyone loves a little fancification, right? 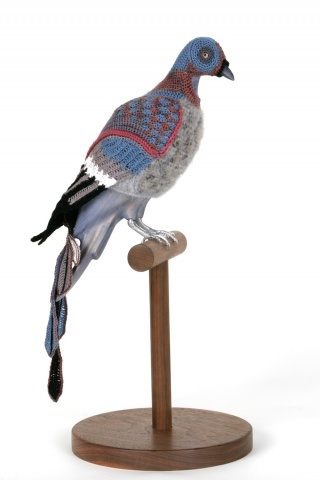 When I finally arrived at the artist's site, I discovered that she dresses wooden pigeon mannequins in suits "that disguise them as extinct birds, thereby (visually) re-creating biodiversity and soothing environmental fears. " I don’t know about soothing my environmental fears, but in finally getting to the artist’s site and statement, seeing the pictures in the web setting she chose for it, I felt immensely enriched by knowing the deeper meaning of her project. And was given a key to open my own door of meaning and associations upon viewing this as the art work it is meant to be. I felt awash in a sense of loss, and then began to think about how we try to recreate stellar moments or experiences or capture them in photographs and how sometimes it just seems sad…. In addition, I got to see the Laurel Roth's other work, which gave even more context to this series, and realized she probably also carved the wooden pigeon mannequins. The lesson here for me is twofold. 1. On the internet as in real life, it’s wise to go to the source of things. 2. When I present something here or am tempted to do a quick repost to social media, I should take a moment and be sure I’m not just sending a pale iteration - a pigeon in an adorable outfit- when I could be sending something far more meaningful. That's some amazing, gorgeous, meticulous work. And I think there's one more lesson here: some people should just shut up about things they don't understand. 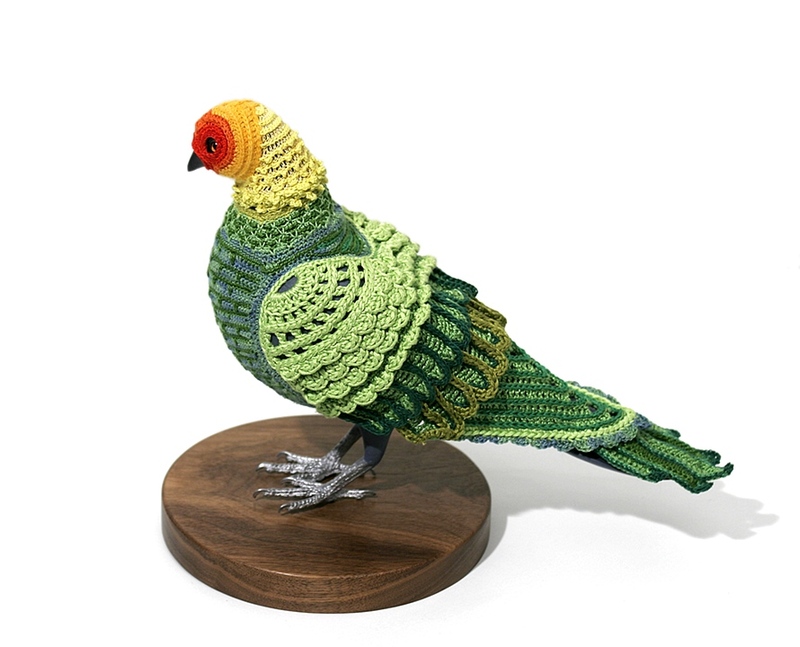 When I first looked at it I thought it was a real pigeon in a crocheted outfit and I wondered how she got him into that. After reading the rest of your article I understand. I agree with Reticula. sometimes even about myself. Haha, Kris - I thought the same thing when I first saw that picture! Carol, my question is, how do we know we don't understand? Agreed, best to pause before expounding on something, get pretty sure we understand. But if we don't understand I'm not sure we can know we don't understand. I think we just have to look for more information and be sure we understand to the best of our ability before we start exponding on some topic or other. and you nail it right there,,, so easy to mindlesslu click "like", but look at the gold you found after a tiny dig. I love this artist's work, adn feel sad the attribution of it does not stay..